Once again I must thank Megi for introducing us all to the Shine SIL510. If it hadn't been for his aggressive marketing campaign (! ), all those years ago, I would never have found such a delightful guitar. I have my SIL510TR (Translucent red) to hand all the time these days, playing it for around two hours a day. 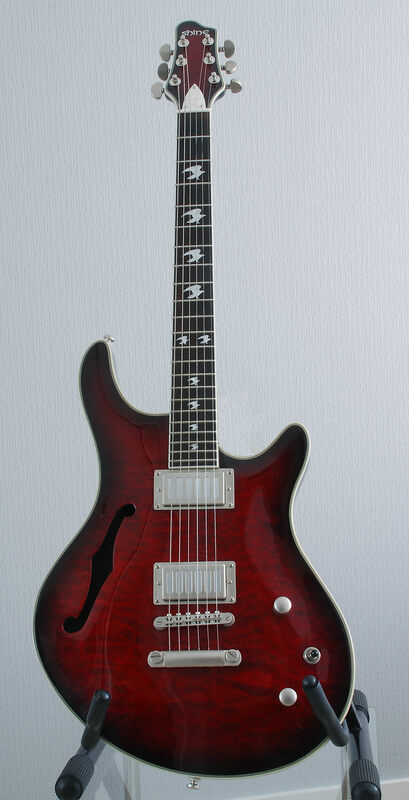 It is an absolutely wonderful guitar to play, with a great fretboard and a great feel to it. It feels very compact, suits my playing style to a tee. I have to say, of all the guitars I own, including my American Standard Strat, it is the nicest guitar to play. I have seriously considered fitting better humbuckers to it, but it really sound quite good as it is, so I haven't bothered. 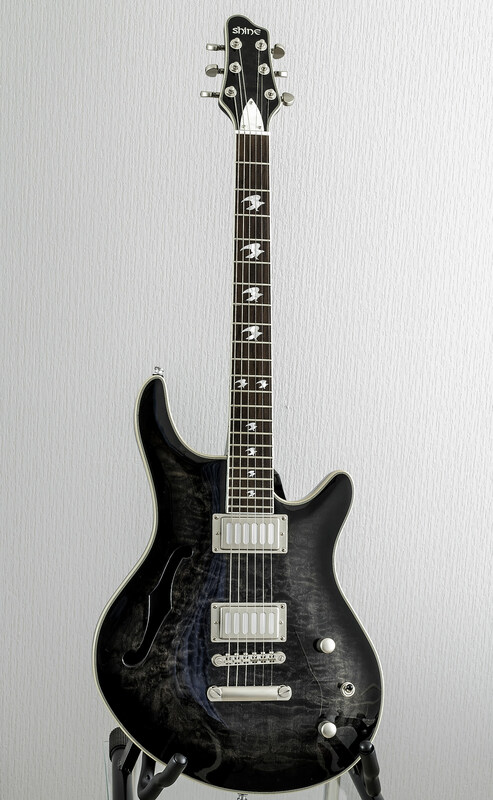 It is a very attractive guitar, with a high degree of finish. If it had a quality name on the headstock it would easily belie its £99 price tag. I also have a TB (Translucent black) one, which I bought with some of the money my workmates presented me with when I retired. I wanted something to keep for posterity. It is every bit as good as the red one (though at the moment it has old strings on it), but I prefer the look of the red. It was, after all, my first choice when I bought one. I am thinking of putting some new strings on it and giving it a birl. I have some Dragon Skin strings I bought and have never gotten round to trying. They might be a good match. I'm not sure you can get them for that now. I don't think you can get that model at all now. It was a bit of an OTT marketing campaign on my part I must admit - a bit embarrassing looking back. But I still use and gig both of mine all the time, and I do think these guitars were a huge bargain. I have them strung with 11-52 round wounds, and they make terrific jazz guitars, but versatile and work well for other styles. There is just something about the sound - fat, warm, but also sustaining and clear. Also the compact, comfortable feel is great. I did change the pickups on mine, and the trans-grey/black one has a coil tap push-pull on the tone control, but I'm sure the stock pickups are just great to be honest. Nice score, Jocko. 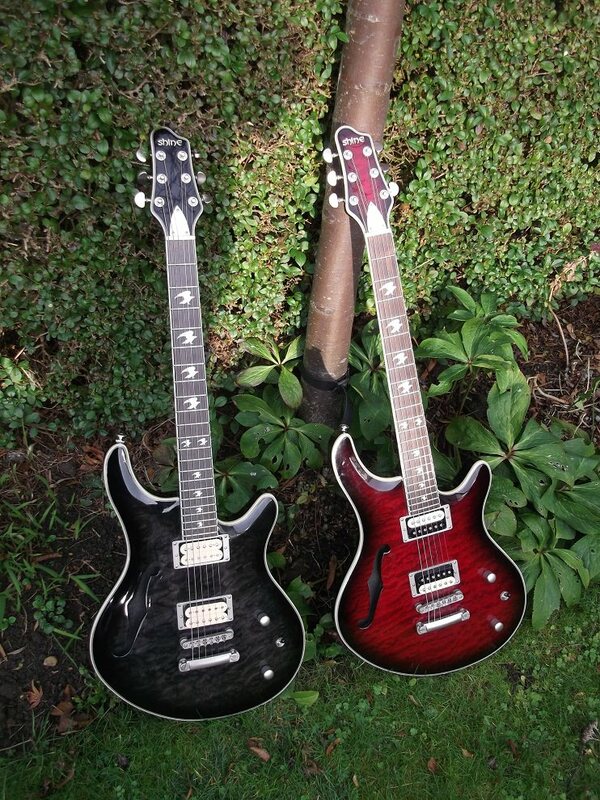 Both guitars look fab. Megi, I can just hear those round wounds on those two. I bet they’re lovely and jazzy and smooth! I have swapped the black one for the red, as my daily player. and am finding it not quite so loud. Could be the strings that are fitted or maybe the pick ups are a smidge lower. Still has that beautiful playing feel. Like an old pair of slippers! I love that feeling. Some people like to fight the guitar when they play. Not me. If a guitar doesn't arrive like that, it takes a bit of work to get it just right, but when you do, it's a wonderful thing. Are those pickups regular humbuckers with foil-like covers? I read somewhere they are AlNiCo V.
They are regular humbuckers - both coils have the flat-topped slugs fitted, then there's a bit of silvered plastic/card on top of that, then the radiator-style slotted metal cover on top of that. The neck pickup is about 8K IIRC, and the bridge about 13.K. I do get more than a bit of hollow body archtop-esque sound quality from mine, despite the only very modest chambering plus f-hole on one side. Especially so when using a jazz-friendly amp, such as a Polytone. I speculate that this may be partly due to the light weight basswood body, but who knows. If I strum a chord, then cover and uncover the f-hole with one hand, I can hear the acoustic sound changing, so the f-hole/chambering does do something in my view. Re the roundwounds, I just like the cut and zing from those - the guitar's natural tone is pretty warm, so no danger of it being too harsh or bright for jazz use. Not sure about the quilted maple neck spec quoted - the finish on the necks is so dark, you can't see any wood figuring at all, so why would they use it? Actually (duh) the "quilted maple" has to refer to the veneer on the headstock. From what I can see of the neck wood, holding the red-burst one's neck up to sunlight, I'd guess mahogony or maybe nato. Good to know- thanks for the details. I do like how those covers look. 8k and 13k sounds like a good balance. I imagine that’s a nice PAF like neck and a slightly overwound bridge? Yum! Drat. Got me hankering for one now, so I’d better go play something to make me feel better! I wouldn't worry about it. They are like hen's teeth. A quick Google turned up none currently for sale. That’s a relief. Ok, as I was, happy and sensible! I just Googled "Shine SIL-510" and an embarassing number of results came up leading to forum discussions in which I seem to be involved. But it's been a buyer's market with guitars for a fair while, and there are always going to be tempting bargains to be found. I'm glad I got those Shines, as they do suit me very well, but I'm sure I would have found something else to rave about. And I think a lot of us have too many guitars these days - an embarrassment of riches really, compared to the days when just getting the cash together for one decent guitar was a struggle. Did a gig last night where I did the posey thing of breaking a string on one of my strats (the gold one), and just switching to another one (the ash one). You’ve left your mark on the internet, Megi. Very impressive! You’re right about the too many guitars thing. I really do have more than I can play. Silly really. Sad thing is that most have no resale value, so I can’t even sell them. I love how you convinced this guy not to sell! Glad to take you down a trip to memory lane! It’s a good thread. https://www.ebay.co.uk/urw/albert9951 - It looks like he may have bought it in May 2016. My two are the same. One's as bad as the other. Ooo! Watch for the repost.